Will you be prey, or will you hunt the hunter? I ran this scenario a while back on low tier. It’s worth mentioning that I’m a fan of investigation scenarios which have some sandbox elements. Without a doubt this scenario is one of such adventures and I had a blast. The players gets a multitude of clues and have to figure out which to follow first. Every playthrough can thus be different given the timeline in which events transpire. It takes a bit of effort on the GMs account to keep track of, but it’s not that big a deal. It sounds more complicated than it is. The storyline makes sense, the NPCs are all flavourful and fights pack quite a punch on the lower tier. However, there’s one major issue I have with this scenario. During the scenario there’s a fairly large chance the players will warn certain NPCs of what is going to happen. There’s nothing written however on how the NPCs react to this. It’s mindboggling that there’s no information in the scenario about what the NPCs will do when asked to tag along for safety or to hide in the lodge. Considering there’s a time schedule in the background, I find this rather weird as it basically means that’s it’s entirely up to the GM whether or not they stay put and die, or whether they hide elsewhere and live. Considering the outcome matters, I feel like this is a major oversight. This scenario showcases how good an investigation adventure can be. Paizo has truly come a long way in that regard and I hope to see similar investigations in the future. I’d love to run this scenario again, so it should come as no surprise I recommend this scenario. I’d have given it 4,5 stars, which I’ll round down to 4 in the hopes that paizo will avoid the flaw listed above next time around. I played in high tier with a group of 5 players. There is quite a bit to like about the adventure. Characters, scenery and story is all nicely done with very few exceptions. Our group somehow managed to never encounter the killer which caused us to lose quite a bit of gold reward, prestige and another boon because we lacked one appreciation point for the orc lady we could have gotten by finding the killer earlier. I wasn't happy about that because neither our rolls nor our choices or ideas about the plot were stupid or wrong. We might have been a bit unlucky and our GM wasn't very lenient about us having warned all the late victims (some were killed anyway). Still I think something like that could have been avoided by some GM instructions about what npcs do when warned about a poison killer and some better clues that actually looking for the killer makes sense. We only had one chance to actually expose the killer in the distillery but we chose to talk to the owner in private and decided against "looking around for poisoners in a city full of assasins and poisoners" among the patrons which seemed pretty wise. So the killer just waited till we were gone, poisoned the lady at the distillery even though we told her not to eat or drink any food whe isn't sure about and we never saw him again after that because of the schedule that didn't line up with our timing. Just adding infos about what npcs do when warned and still getting full reward when not running into the killer on accident I would have liked more. Also the plot poison that you can't stop with normal means is a bit heavy handed but I guess it's needed to actually get the adventure going. Our druid would have cured the venture captain twice if it weren't for that. Played this at the 6-player high tier (APL 4) with a party only somewhat capable of investigating properly. Our knowledge and social skills were subpar, but weer managed a near-total success. This doesn't mean the scenario was easy for us though, but by following the right clues from the multiple ones you'll get, you can compensate for a lot. Right off the bat, the local setting crashes its flavour on the party, which starts off an interesting adventure. The combats were fun, and fit for the plot. No doubt playing a Vishkanya made some obvious checks a lot easier, but still the opponents managed to deliver a punch. This ranks the scenario as one of the better investigation scenarios I've seen. I ran this at Subtier 1-2, using the four-player adjustment. I thought it was a strong start to the season, as the scenario has an excellent mix of role-playing, investigation, and combat. Daggermark is a great setting for an adventure like this. 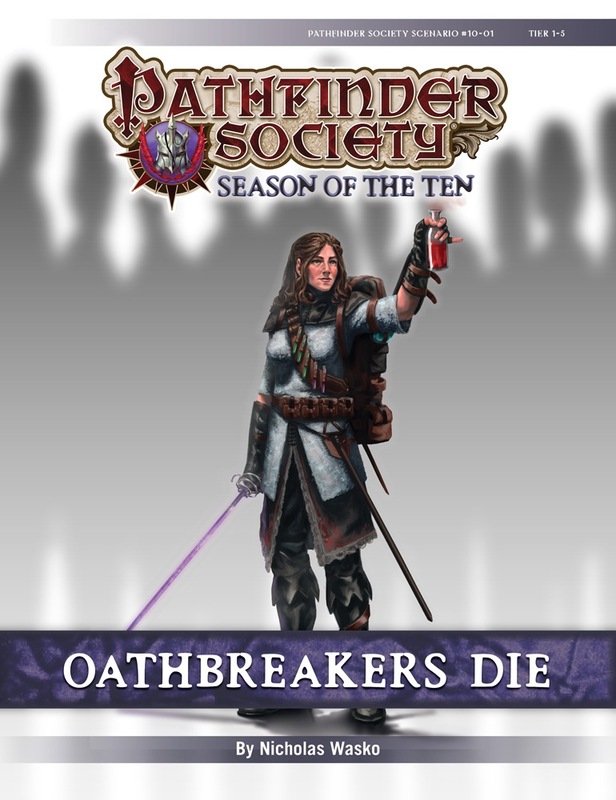 Oathbreakers Die is one of those rare scenarios with a complicated backstory that actually makes its way to the players and helps enrich their understanding of what's going on and why. It is a scenario that's complex to prep and run for GMs, and one that falls on the longer side (duration-wise). In other words, this isn't one I'd recommend anyone try to run cold or haphazardly, but it's definitely worth the investment of time and effort to do right. 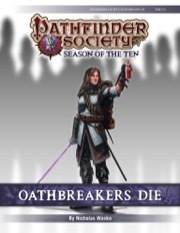 The premise behind Oathbreakers Die is that a secret cabal of former members of the Daggermark Assassins Guild have hatched a scheme to take over the country's military and become a force unto themselves. But when a member of the Pathfinder Society in Daggermark learns of the plot, all of the Society's agents in the city are targeted for death. The PCs have to try to protect the agents from assassination while simultaneously figuring out who is behind the plot so that the Society has a future in the city. The scenario starts with one of my favourite briefings ever, as Venture-Captain Istivil Bosk dies mid-way through his explanation of the PCs' mission! Bosk has been poisoned, and PCs who give him the antitoxin sitting on his desk will be shocked to learn that they've made things worse--the poison has an added ingredient (a new formula called arcane amplex) that interacts with antitoxin to create a thick foam that suffocates the victim's airways. At the levels the PCs are at, the best they can do is delay Bosk's death for a couple of rounds, but his death is inevitable. However, a search of Bosk's office (with a nice array of skill checks being useful and important for various aspects of the search) turns up the name of another Pathfinder who is in danger--a gnome named Timinic who has been mapping Daggermark's sewers. Timinic has been placed in a hidden safe house, but PCs can head to where he often started his mapping expeditions (a tavern called the Dripping Wall Distillery) or follow up on other leads involving either the last man seen alive with Bosk (a dwarf named Brandur) or where the arcane amplex was invented (a local alchemist shop named Pemak's Tinctures). This part of the scenario can proceed in any order. From this point, the GM has to keep careful track of how much time is being taken by everything the PCs are doing. The reason is that Bosk's assassin (a doppelganger) is at large and will be murdering a list of individuals based on a set timeline. There's a handy graphic showing how long it will take the PCs to travel between each location in the scenario, as well as a stated shortcut for estimating how long conversations with various NPCs will take. The fun part of all of this is that the PCs may be behind the assassin the whole time, may arrive at a location while he's in disguise and stalking a victim, or may arrive at a location first. There's a lot of permutations on how/whether/if/where the assassin will be fought, making it a fun scenario to GM. I kept the time-keeping stuff all "behind the screen" when I GM'd it, and just left it up to the players to realize that time was of the essence--it worked out quite organically that way. The locations and NPCs that the Pathfinders will encounter during their investigation are all interesting and well-described. One of the things I thought the writer did quite skilfully was to ensure that the PCs could still get the clues they needed to proceed even if they got to a location too late to save a particular NPC from being murdered (but that getting there sooner would make getting the information easier and result in more complete information). It's a delicate balance that was pulled off beautifully here. I think the only quibble I had with this part of the scenario is with the half-orc alchemist, Pemak (who originally invented the arcane amplex). There's a sort of rules sub-system that GMs familiar with PFS scenarios will be familiar with: PCs' interaction with Pemak is gauged and tracked with "Approval Points," and one of the success conditions (as well as some in-scenario events) are dependent on how many Approval Points the PCs earn. However, I didn't think this system was set up well in the scenario and it didn't run smoothly when I ran it; the PCs were primarily concerned with quickly tracking down the assassin and their allies, and didn't naturally engage in the lengthy conversation on various topics that the Approval Points sub-system seem to envision here. Tracking systems like these need to implemented organically and for goals that the PCs will be clearly motivated to achieve. The final third of the scenario sees the PCs uncovering the identity of the cabal: a group called the Ghostknives, which is made up of rejects and dissidents from Daggermark's official Assassins Guild. The Ghostknives are led by an alchemist named Cladara, and they've set up their headquarters (as thieves and assassins are wont to do) in the city's sewers. The "Thieves Guild" flip-mat is put to excellent effect here. The PCs' have to contend with a violet fungus (a plant creature capable of some nasty poison effects), several lesser assassins, and then Cladara herself. The violet fungus was pretty easy to beat when using the four-player adjustment and the lesser assassins were the generic "rogues with sneak attack" variety, but the encounter with Cladara was pretty fun as her stinking cloud bomb made things tough for the PCs (until one got close enough to put her down with a single swing!). I'm not sure a conventional dungeon crawl was the right way (thematically) to conclude a scenario that had so much interesting intrigue and detective-work in the first two-thirds, but I do understand the need to have a certain amount of combat in every adventure. All in all, I really enjoyed Oathbreakers Die. As I said in the "No Spoilers" section above, it's definitely much more of a challenge to prepare and run than some conventional "five rooms and five encounters in the museum" scenarios. There's a lot of careful tracking and attention to detail that's necessary to make everything flow together smoothly. Still, I admire the writing that went into it, and at this stage in PFS Organized Play, we should be able to handle complex scenarios. It's one I'd happily run again just to see the different permutations of what could happen with different groups. There were two things that struck me as being rather unusual about this mod. I wasn’t sure I liked them as I was playing it, but after thinking it over for a couple of days I think they are actually good things. 1. Timing matters. I don’t know all the mechanics (and how much work it is from the GM’s perspective) but there’s a timeline that happens whether the PCs are there or not. The plot does not wait for the heroes to show up at just the right moment. It feels slightly frustrating if you miss catching character X at location Y, but it also feels realistic. 2. There’s a feeling (at least in our game) that things are going off the rails and the bad guys might be winning. People are getting poisoned and assassinated (presumably not a spoiler if you read the description of the mod). You may not get there in time to save them all. I started to wonder if we let too many people die if we were in danger of losing one or more PP. That felt different from most Pathfinder games I’ve played but it also feels realistic. So, if you like the standard heroes ride in, fight three fights, pass some skill checks, and save the day this might feel a little different. Different isn’t necessarily bad. I would repeat the previous reviewers comment that this requires a well prepared GM. There does seem to be some fiddly bookkeeping behind the scenes, though I have not run it myself. Since the PCs do not know where assassins could lurk, some GMs may wish to provide maps for areas that do not ultimately contain combat encounters. Good maps for this purpose are Map Pack: Village Sites and Flip Mat Classics: Pub Crawl. Rogues at tier 1-5? No problem. Oh, I've read the scenario. Those could be infamous last words. This looks like it could be fun. I'm reading through it now. But I don't quite understand something at the very beginning. The potion of delay poison. It seems to hint at places the players should give it to Bosk, yet if I'm reading this right, he will immediately die if they do. This seems confusing. Am I missing something? Take those types of questions to the GM discussion thread. Oh, sorry, didn't know that was a thing.